Bring the whole family to the Ely Stage Stop & Country Museum on Sunday, January 7, for the monthly Fiddlers’ Jam. Musicians will meet in the Ely barn to perform their wonderful Americana music from noon till 2 p.m. 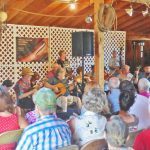 The event is free, but donations made during the event benefit both the Ely Stage Stop, helping to fund the blacksmith shop, and the Old Time Fiddlers Association, helping to fund their scholarship programs. Enjoy the music with beverages and tasty treats provided by the Ely volunteers. Bring your own wine and sip it in Ely Stage Stop wine glasses that are available for purchase. Come ready to clap your hands and tap your toes. We’ll even make room for those who want to get up and dance! This is a free, family friendly event for all to enjoy, young and old alike. The fun begins at the museum at 11:00 a.m. with the Fiddlers playing in the barn from 12 noon through 2 PM. So come early to enjoy all of the newest museum acquisitions and displays.Take a hayride (weather permitting) or stroll the barn trail. Lake County Historical Society’s Ely Stage Stop & Country Museum is located at 9921 Soda Bay Road in Kelseyville, near Clearlake Riviera, just north of Hwy 29-Kit’s Corner. Current hours of operation are 11 a.m. to 3 p.m. each Saturday and Sunday. Fiddlers’ Jams occur the first Sunday of every month from noon until 2 p.m. Private tours can be arranged by appointment. Facilities are available to support events, conferences, or family gatherings. Celebrate a wedding, reception, special anniversary, or family reunion. Use our newly created outdoor stage to hold music events. Come join the Lake County Historical Society and become a volunteer at Ely.. Applications will be available during the day. Join the fun!